ABUJA – PRESIDENT Muhammadu is presently meeting behind closed doors with security chiefs at the Presidential Villa, Abuja. The meeting is taking place at the President’s office. 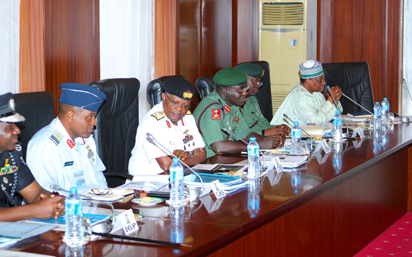 R-L; Minister of Defence Brig Gen Mansur Dan Ali, Chief of Defence Staff General Abayomi Olonisakin, Chief of Army Staf Lt General TY Buratai, Chief of Naval Saff, Vice Admiral Ibok Ekwe Ibas, Chief of Air Staff, Air Marshal Abubakar Sadique and Inspector General of Police, Alhaji Ibrahim Idris during Security meeting at the State House in Abuja. The meeting started just after the National Economic Council meeting chaired by Vice President Yemi Osinbajo.